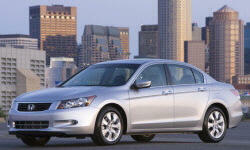 Hondas are known for reliability and value. They run forever. Those I owned were prime examples of this. The trunk hinges take away a lot of cargo space. Every car I test drove (Mazda 6, Hyundai Sonata, Ford Fusion) was much quieter.